Hill's Science Plan Canine Advanced Fitness Medium Lamb & Rice is tailored to provide excellent all-round nutrition while supporting muscles and digestive health. The food contains high quality lamb, which is very easy for your dog to digest. This makes it gentle on your dog’s system, ensuring a healthy digestive process. Omega-3 and 6 maintain your dog’s skin health, as well as contributing towards a shiny, colourful coat. Additionally, taurine is included in the blend, which aids conversion of these fatty acids into energy. The lamb protein is supplemented by meal and ground rice. This high level of protein contributes towards a lean muscle structure and overall muscle health. 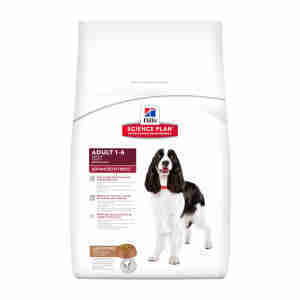 As all the ingredients in the food are high quality, your dog'll be certain to enjoy the taste. Antioxidants in the food promote a strong immune system, while helping to combat free radical formation in your dog’s body. These can attack the immune system if left to build-up unregulated. Your dog’s digestive health is equally as important as our own. If problems start to occur, then your dog could end up suffering from a variety of serious conditions. Obesity, inflammation and even colon cancer could be a very real risk, for example. One of the causes of bad digestive health is introducing new foods too fast, but additional factors might be stress, a poor diet, or a recent course of antibiotics. All of these factors can lead to an imbalance in the bacteria in your dog’s intestines. Diet is one aspect that you can control to help minimise this problem. A good diet can also contribute to your dog’s muscle health. This is vital of course, for your dog to continue enjoying an evening run in the park or walk around the block. Maize, wheat, lamb meal, soybean meal, animal fat, maize gluten meal, brewers´ rice, digest, vegetable oil, flaxseed, minerals. Protein 21.8%, Fat content 14.5%, Crude fibre 1.7%, Omega-3 fatty acids 0.52%, Omega-6 fatty acids 3.39%, Crude ash 4.8%, Calcium 0.76%, Phosphorus 0.66%, Sodium 0.24%, Potassium 0.64%, Magnesium 0.11%; per kg: Vitamin E 600mg, Vitamin C 70mg, Beta-carotene 1.5mg. E672 (Vitamin A) 25,146IU, E671 (Vitamin D3) 1,056IU, E1 (Iron) 242mg, E2 (Iodine) 3.6mg, E4 (Copper) 30.7mg, E5 (Manganese) 10.7mg, E6 (Zinc) 206mg, E8 (Selenium) 0.5mg; with natural antioxidant. My cocker loves the food and you can’t beat the service from Pet Supermarket. From the ordering process to delivery, it’s smooth and easy. We've been purchasing this dog food for our two black labradors for over 4 years, the quality is excellent, the dogs love it and they are in an exceptional healthy condition. The service from Pet Supermarket is also excellent and great value. Our two cocker spaniels who do not know how to stop running really need a good quality food to keep them in tip top condition, this food does that. They soon clear their bowls so it must taste good. The price is very good and always a fast delivery, despite being tucked away in the highlands of Scotland! Have always given this to my springer spaniels and all have lived to a good age without any problems.excellent service always provided by this website and prices very good .